e-shop, emails and Facebook Messenger. 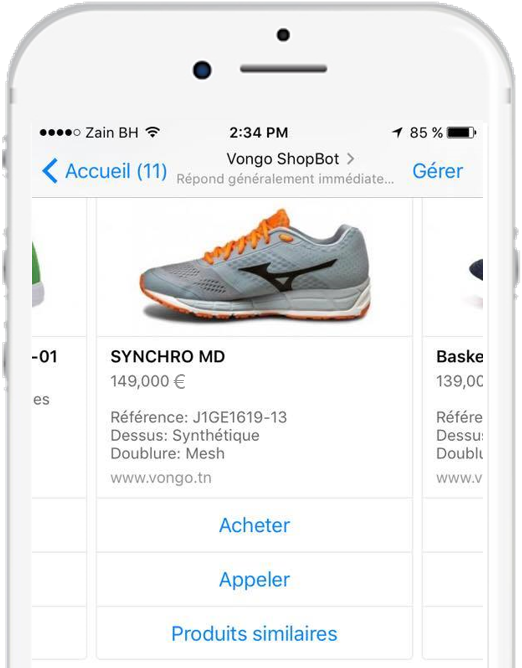 Put a seller behind each customer across all channels : e-shop, emails and Facebook Messenger. and buying the right products. Always-on chatbot on Facebook Messenger to interact in real time with your customers and to help them selectingand buying the right products. Recommend the most relevant products to each customer on all pages of your web site while promoting upselling and cross-selling. Personalize your newsletters and activate marketing automation emails to reduce shopping cart abandonment and increase your customers’ loyalty. Easy to activate by installing a native connector or a tag and a product feed through platforms you are already using. Simple to use through an intuitive administration interface. Easy to activate by installing a native connector or tag and a product flow via platforms you are already using.